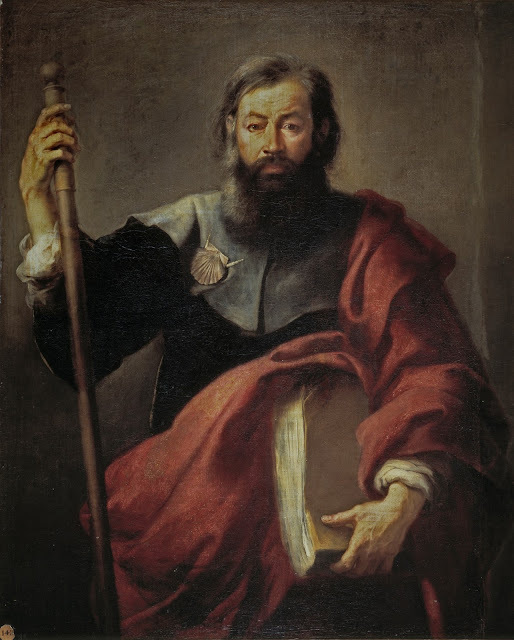 Bartolomé Esteban Murillo was the leading exponent of the seventeenth-century Sevillan school, which was known for its seamless blend of realism and sentimental beauty in painting. Murillo presents an image of a strong and upright man but no longer in the flush of youth. But it is his face and in particular his eyes which is the central feature of the painting. "Lord, wilt thou that we command fire to come down from heaven, and consume them?" The worldly ambition has gone. So has the ideological zeal. The prophecy of Jesus about James is fulfilled. He was to drink of the cup that Christ was to drink of in the Passion and Crucifixion. In Matthew 20 his mother pushed him and his brother forward to Jesus and got them to ask to sit at either side of Jesus in his kingdom. He and his family thought that the kingdom which Jesus spoke about was of this earth and time. They thought it was about power. They (like the rest of the Apostles) did not understand. "The Request of James and John. 20 Then the mother of the sons of Zebedee approached him with her sons and did him homage, wishing to ask him for something. 24 When the ten heard this, they became indignant at the two brothers. 25 But Jesus summoned them and said, “You know that the rulers of the Gentiles lord it over them, and the great ones make their authority over them felt. 27 whoever wishes to be first among you shall be your slave. Aren't these renditions the kind that move the hearts and souls of man? Love of God moving the hearts and souls of man.